There have been many reviews of the available evidence by the world’s public health bodies and studies published in health science journals. Not one of these has concluded that wind turbines adversely impact human or animal health beyond some annoyance in some people. The list is too long to repeat on this page, I have tried to include links to the important articles in a page on wind turbines and health. Senator Day has chosen to ignore the science and believe unsubstantiated claims and rumour. Dose: There is little, if any, correspondence between a person’s exposure to wind turbines and their likelihood of reporting symptoms. The intensity of anything radiating from a wind turbine must decrease with distance according to the inverse square law of physics. The claimed illnesses are just as likely to occur at larger distances rather than smaller: they show no dose-response correlation, which is quite counter to the science of epidemiology. Selectivity: The great majority of people are unaffected by nearby turbines and the alleged cases of illness are almost all in people who get no financial benefit from the wind turbines and in those who started with negative opinions about turbines. Farmers who are receiving lease payments and wind farm workers hardly ever claim a health problem from turbines. The ‘problems’ are almost entirely confined to English-speaking countries (because that’s where they have had the publicity). My own experience: I have visited many wind farms on many occasions, have even slept beneath operating wind turbines a number of times, in a cabin 850m from an operating turbine twice, and in avacant house 500m from a wind turbine on another occasion. I have never heard sounds from the turbines loud enough to be unpleasant. I have never felt any ill-effects that might be ascribed to infrasound or any other emanations from the turbines. The fear and anxiety toward wind turbines that is instilled in some people by irresponsible rumour mongers and unethical or ill-informed journalists may lead on to psychosomatic disorders. These people are largely to blame for the epidemic hysteria around wind farms that we are seeing in some English speaking countries. Previous Previous post: Opinion: Off-grid, or not? 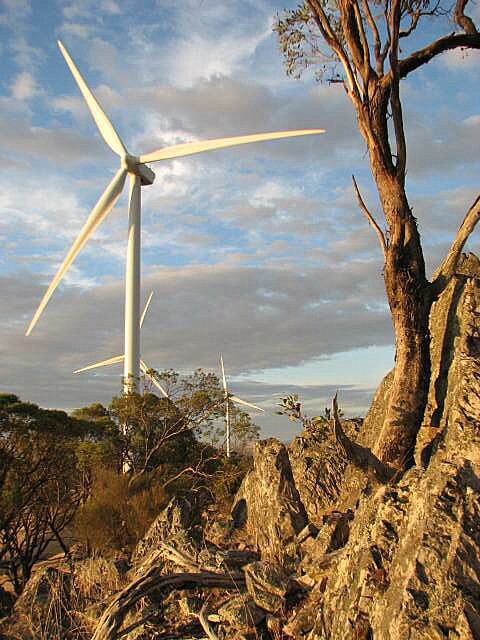 Next Next post: Vic Budget 2015: First steps towards climate action. Comprehensive plan needed.